There is always interesting history behind London's street names. In this case it's Carting Lane, which used to be called Dirty Lane. The sewer gas destructor lamp is a replica of the original Webb Lamp. This dual-purpose lamp was designed both to reduce the hazards (and odour) of explosive methane gas that built up in sewers, and also to cast light on the streets of England’s cities. A flame was generated by burning the normal gaslight gas, sewer gases were drawn up and burnt off along with the regular gas to produce less unstable (and less smelly) carbon dioxide and water vapour. Web sold thousands of these lamps. One of his masterpieces once stood in Carting Lane, next to the nearby Savoy Hotel on Savoy Place, casting its light on the rich and famous guests of the day. 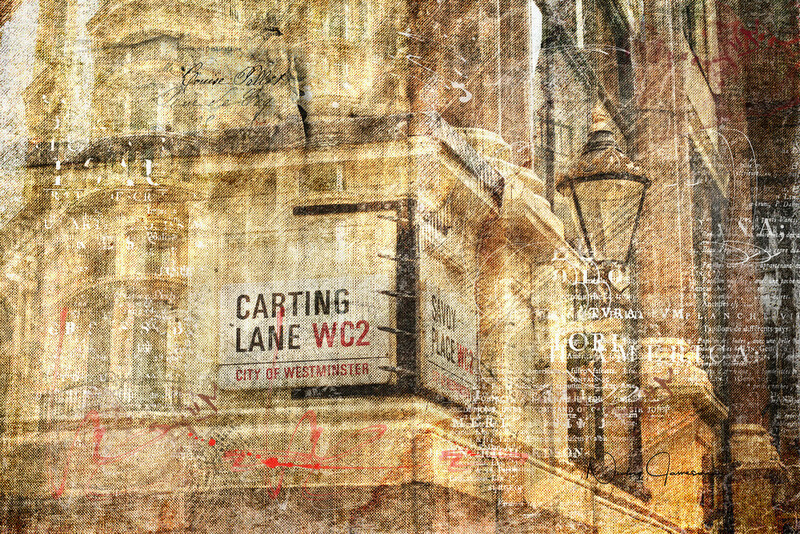 This print is available in a variety of finishes and sizes to suit home or work and is best in canvas to appreciate the beautiful textured artwork and elements.